Fresh squeezed orange juice is a wonderful treat. A far cry from what passes as orange juice at the grocery store, the real deal is incredibly fruity, sweet, and is loaded with Vitamin C.
Unless you have an orange tree in the backyard, drinking fresh squeezed OJ may not be the most cost effective beverage, but it sure is wonderful treating yourself (or someone else) to a glass for brunch, Mother’s Day, or on a hot summers day. Everyone knows that oranges are a great source of Vitamin C. What you may not know is that fresh orange juice is also fairly high in Thiamine (B1), Folate (B9), and potassium, amoung others. As such drinking fresh orange juice can boost your immune system, aid in blood circulation, and even help detoxify your body! There’s really no reason not to drink it! Plus, store bought orange juice is not actually as healthy for you as you might think. It has a lot of extra added sugar, and the vitamin C actually starts to degrade as soon as the juice is squeezed. This means that all the ‘goodies’ need to be added back into the juice to make it ‘healthy’ again. Doesn’t sound right to me! 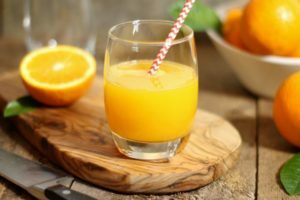 Removing the pulp (which most commercial brands do), also removes many of the vitamins and minerals which you would get from squeezing your own orange juice at home. It really doesn’t matter what type of oranges you use to make your fresh squeezed juice. 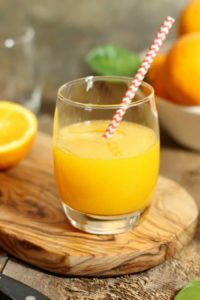 Sweet Oranges include varieties such as Valencia, and Navel Oranges, but Blood Oranges, Clementines, Mineolas, and Tangerines can all be used to make homemade orange juice. Of course the variety of orange will effect the flavor and natural sweetness of the finished product, but this basically comes down to personal preference! Sean has a great guide to citrus and oranges in particular on his blog Diversiovre. Check it out to learn more about different varieties and how you can use them in your cooking! 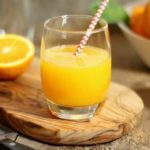 Freshly Squeezed orange and other citrus juices are perfect for using in homemade cocktails too! The best part about squeezing your own orange juice is that it’s easy!! Simply wash, cut, and squeeze the juice to enjoy this healthy beverage. Of course there are many different tools you can use to make this process easier. If you’re only making a glass or two of fresh squeezed orange juice, doing it manually isn’t a problem. If your serving a large group though, or making mimosas for a BBQ, or brunch, it may be worth using some specialized gear. While an electric Sunkist commercial juicer (affiliate link) is a wonder to behold, (seriously this thing is a beast!) you can easily use any juice press or hand held juicer to make the job easier. 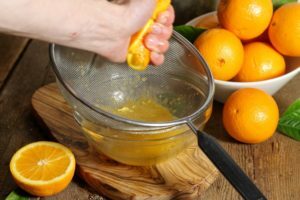 A good strainer may also be a good idea to have on hand, especially if you or your guests prefer pulp free orange juice. How Long Can You Keep Fresh Squeezed Orange Juice In The Fridge?? Freshly squeezed orange juice can be kept in the fridge in a non-reactive, air tight container for 2 to 3 days. The acid in the juice will start to eat away at plastic, so using glass bottles or mason jars are the best option. Stainless steel containers or bottles will work as well, but again, the acid may react with some metals leaving an off taste. Wash the oranges to remove any potential pesticide residue. If the oranges are very firm, roll them on the counter top with your palm while applying downward pressure. This helps break up the individual segments and juice-filled vesicles. releasing more juice. Cut the oranges in half with a sharp knife. Using a hand held citrus reamer, (or an electric juicer), twist the flesh of the oranges on the reamer to extract the juice and pulp. 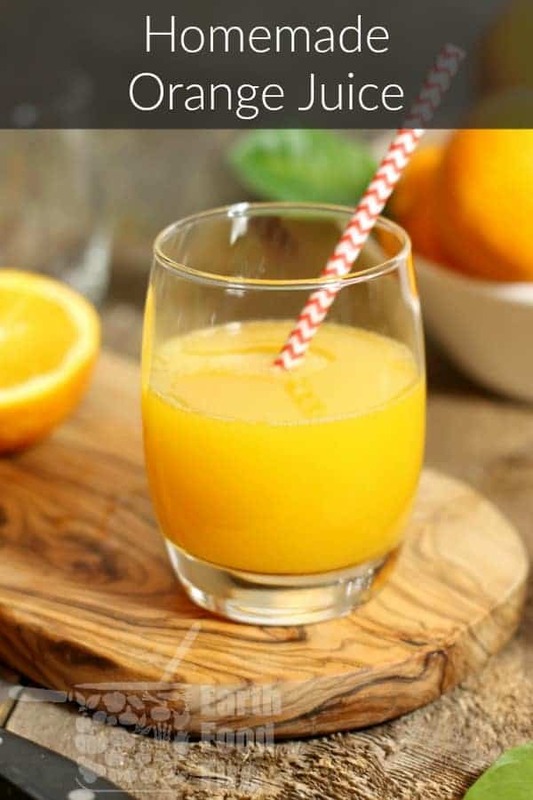 Pour the freshly squeezed orange juice into a glass and enjoy! If you prefer pulp-free orange juice, use a strainer to remove the pulp before serving the orange juice. Markus, thank you for sharing this! I have made this so many times. Everyone that tries it, loves it! Glad you enjoy the juice, but really, who doesn’t love OJ! This was yummy! I would definitely make it again! Thanks Anna, Fresh squeezed OJ is the best, I agree! This is so tasty, fresh orange juice is my favorite! Thank you for sharing your excellent recipes! Yum! this is perfect for Mother’s Day Mimosas! I can’t wait to try it. There’s nothing quite like freshly squeezed orange juice! I like to leave the pulp in mine. You’ve talked me into a nice, delicious glass of fresh orange juice! It sounds so good; thanks for posting this!